For volume discount (6 bottles or more), click here. Shipping is free within 50 USA states on order over $75. Cellfood's 1 oz. super-concentrate makes over 22 quarts of super-energized dietary supplement. 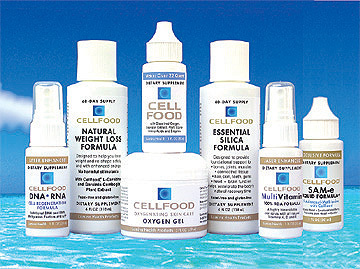 Cellfood is the true cell-oxygenating formula made for athletes & sports enthusiasts. Performance in endurance sports depends on the delivery of oxygen to the working muscles. Used by men and women in over 70 countries around the world. When you mix Cellfood with water or juice, its water-splitting action begins in the body the moment you take the first sip. This cascading time release of oxygen peaks within 8-12 hours, and then keeps working hour after hour. And, its natural minerals, enzymes, amino acids and electrolytes are delivered simultaneously throughout the body on the deepest cellular level. 1. Released oxygen cleans cells, stimulates cellular respiration and provides cellular energy around the clock. 2. Released hydrogen builds, solidifies and repairs vital tissue cells and the immune system. 3. Free radicals are widely believed to be one of the major causes of biological aging. Negatively charged oxygen, which is released by Cellfood, bonds with free redicals and converts them to safe, stablized oxygen.